Strand of pearls? Check! Nails painted a polite, neutral shade? Check! No one can tell you that you're not a lady. When you hit the bar tonight, you'll no doubt have on a pretty prim pair of pumps. Not sure which ones to wear? These bejeweled peep toed pretties from Giuseppe Zanotti (available at Neiman Marcus) scream refined femininity. 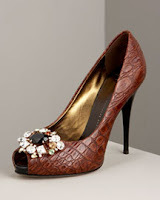 Luxe crocodile-embossed leather will cradle your foot in buttery softness, and a cluster of jewels accenting the toe adds a little extra allure. They don't scream for attention, but ladies know it's better to be noticed than to attract stares, right? Just be sure that while you sit atop your barstool with your ankles properly crossed (right over left, of course), you sip on something that's as sweet and sedate as you are. A cultured lady always goes for something classical, so opt for a "Mozart". Made simply by combining vodka (I suggest Chopin if you want to keep the theme going) with chocolate liqueur (Godiva, no doubt). I'm sure you'll remember to sip slowly so as not to overdo it. A heavy buzz is never becoming.